Whernside rises up directly behind Broadrake, the long ridge from it's summit descending gradually to the southwest towards Ingleton. It is the highest of the famous "Three Peaks" though generally considered to be the least shapely of the bunch. However it is still a worthwhile expedition and the extensive views from the top on a clear day include Morecambe Bay, the Lake District, and the Howgill Fells as well as the Yorkshire Dales. Most of this walk follows the route of the Three Peaks Challenge so you are unlikely to be alone and on busy summer weekends you will see hundreds of other walkers. The route as described goes clockwise getting the steepest section over early on, but you can of course walk it either way round. From Broadrake take the path to the right across one field then turn right to take the obvious path heading up towards the ridge. Sections of the ascent have flagged steps and the final climb to reach the ridge is very steep. If descending this way take extreme care, particularly in wet or icy conditions. On reaching the ridge there is still about a mile to go to the top. Turn right up three steeper sections to start with, each a little shorter than the one before, after which the ridge continues to climb gently before a final steeper section to the summit. From the summit continue along the ridge until the obvious path swings down to the right descending on flagged steps initially. On reaching a stile cross and continue down the path to the right to reach the railway line. Just before the railway note the impressive Force Gill waterfall on your right. Cross the railway on the intriguing combined bridge and aqueduct, following the track past a slightly creepy derelict house and Blea Moor signal box. After the signal box take a right turn under the railway and follow the track past Winterscales, after which it becomes a surfaced lane continuing on to Ivescar. Through the farmyard ignore the right fork up towards a cottage, but take the lower track across the field. After another field cross a railway sleeper bridge over what is usually a dry stream bed then head for the small gate slightly up to the right. Continue across a couple more fields back to Broadrake. 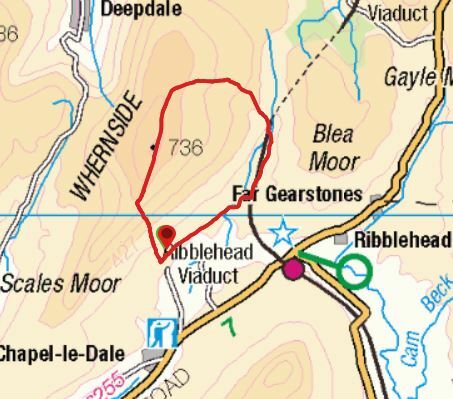 As a shorter alternative you can, of course, follow the route to the summit and then retrace your steps. It does mean you will be doing the steep section on the way up and down. If you are staying at Broadrake during summer when the days are long an early morning, late afternoon or early evening ascent is recommended, likely to be a lot quieter and the evening light can be stunning.